A really nice unit so impressed, a work of gifted Sony Art! Thanks Blade. 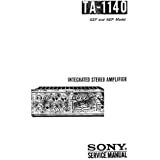 Short demonstration of a sony TA 1140. More vintage audio gear can be found on the following link. Short demonstration of a sony TA 1130. This amp did have some isseus and is been repared with original parts like the old type's of FETS. Very hard to find these days.